Home › Other › What is the Best Divot Repair Tool? What is the Best Divot Repair Tool? Using a divot tool is quite simple, but many people still do it wrong. Once you find your ball in the green and discover that it has left a dent on the ground, simply stick the golf divot tool to the ground around dent and gently push the tool towards the damage area. Do this on all sides until the hole is completely covered up. A simple tapping of your club will flatten the green once again making it smooth and straight. The whole repair process should take less than 10 seconds. Check out the video from the USGA for the proper technique (skip to about 50 seconds in…). You can probably pick up a free cheap, plastic divot tool from your local clubhouse — but if you want to have a reliable, durable divot repair tool that looks great and makes your friends jealous, then check out some of the products below! $20 for a divot tool? You’re damn right. If you’re a loyal fan of Scotty Cameron putters, and want to use what the pros use, then this is the one and only divot repair tool for you. Its simple, unique design helps provide extra leverage so you can effortlessly repair ball marks and maintain the green’s pristine condition. The three grip holes increases the traction on your fingers and prevent slips. The tool itself is made from high quality tumbled aluminum. An offical Titleist / Scotty Cameron Studio Design mark is etched on the bottom to show that you have the real deal. Originally created in 2001, this is easily one of the best divot repair tools on the market, and was only available with the purchase of a Scotty Cameron Studio Putter. The only downside is that — unless you’re a loyal Scotty Cameron fan — we have a hard time just thinking of spending close to $20 for a divot tool. If that doesn’t deter you, then you can get your own here! 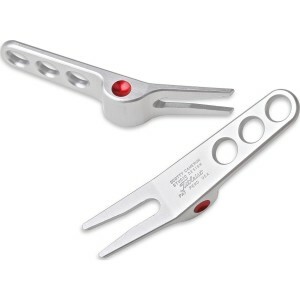 Buy the Scotty Cameron Divot Repair Tool here! Check out the Black Version here! Fan of the NFL? Then rep your team this offseason with a team branded golf divot tool! The NFL Golf Divot Tool is a high-quality, and durable divot repair tool. The package includes a divot tool, along with 3 double sided ball markers. The ball markers are magnetic so they can conveniently stick to the divot tool when not being used. This metal divot repair tool has a nickel color finish and is currently one of the highest rated products when it comes to durability. 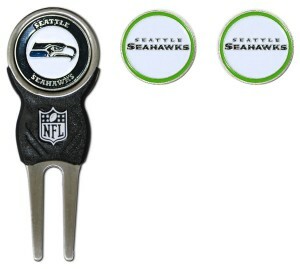 Buy NFL Golf Divot Tool here! Want a divot tool that is under $10, looks great, is durable? 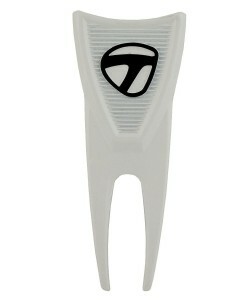 Then this ergonomically designed divot tool from TaylorMade is for you! It has a simple, clean white design, is easy to hold, and easy to use. It is made from metal, so is very sturdy and durable, unlike some of those cheap, plastic divot tools found at your local clubhouse. Another great element of this divot repair tool is its use of premium high rust resistant finish. You don’t need to be weary of getting it wet or leaving it in the rain. This divot tool also includes a handy magnetic ball market which you can stick on the back. If you just want something simple, no-frills, and high quality, this this is one of the best divot repair tools on the market. If you’re a fan of TaylorMade, then that’s just an added bonus! Buy the TaylorMade Divot Repair Tool here! Want to feel like James Bond everytime you pull out your divot tool? Then check out this sweet switchblade action style divot tool from Pitchfix. With a push of a button, the fork will flip out and bring oohs and ahs from the crowd (or your friends). When not in use, the fork stays hidden so it won’t poke you in your leg, or rip holes in your pockets. The tool itself is made with lightweight, durable aluminum sheets, with a rubberized grip that is comfortable to hold and use. Like most other best divot tools, it also comes with removeable ball marker that is attached by the magnet to the back the tool. 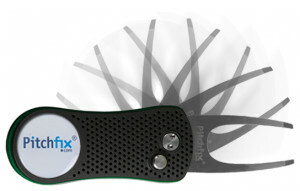 The Pitchfix is available in a variety of colors, so you can get one (or multiple) to suit your style. Overall, the Pitchfix Divot Tool is simply one of the best, highest rated, and most popular divot repair tools ever to be on the market. You definitely will not be disappointed with your purchase. Buy the Pitchfix Divot Tool here! Another great “switchblade” style divot tool is this one from Greenbuddy. 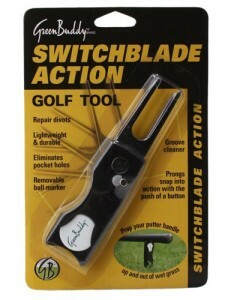 They actually claim to be the original switch action divot repair tool on the market, although that doesn’t really mean much. The moving parts are all made from steel, to ensure durability. Outer parts though are made from plastic material (polycarbonate). This helps keep the tool lightweight, but also gives it a cheaper feel than other tools like the Pitchfix. The unique feature of the Greenbuddy, is the top part is shaped so that you can rest your putter on top when chipping (or iron on top when putting). This keeps your handle dry and clean. This divot tool also comes with two ball markers. Buy the Greenbuddy Switch-Blad Divot Tool here! If you plan on hitting any greens, having the best golf divot repair tool in your bag/pocket is a necessity. It is also just proper etiquette to quickly repair any ball marks so that it will not be a negative factor for other golfers and the overall course maintenance. Divot tools also make great gifts for any golfer. So, pick up your own today! The 12 Best Golf Gifts for Golf Lovers What are the Best Golf Club Brands? What are the Best Golf Hats? What are the Best Golf Tees?